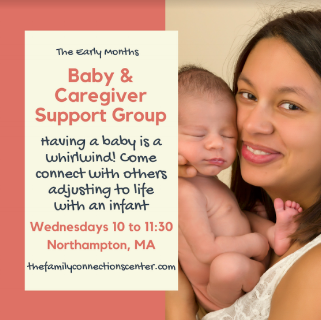 The Family Connections Center, located in the heart of downtown Northampton, MA, offers emotional health services for individuals planning on having a baby, expecting parents and families with children ages 0 to 5 years old. We also provide professional trainings and consultations on perinatal, infant and early childhood mental health. Beginning in March, 2019, The Family Connections Center is excited to offer a series of four talks on topics related to perinatal and early childhood mental health. Come join us for lively presentations by experts in the field, intimate, small-group discussions, and the opportunity to connect with colleagues and meet new ones. Infant-Parent Mental Health Case Conference. Dorothy Richardson, Ph.D.
LGBTQ Parents’ Adjustment to Parenthood. Abbie Goldberg, Ph.D.
An Attachment Approach to Perinatal Mood Disorders. Carolyn Broudy, M.D. COST and CEUs (for social workers and psychologists): 2 CEUs will be provided for $25/sessions, or 8 CEUs for the discounted rate of $80/series (for all 4 talks). FREE if you don't want CEUs. REGISTRATION: Email me directly at cbroudy@gmail.com, with “Salon” in the subject line. Availability is limited and space will be provided on a first-come first-serve basis.